Jiu-jitsu.News: Young Ukrainian champion conquered Abu Dhabi sports arena! Young Ukrainian champion conquered Abu Dhabi sports arena! 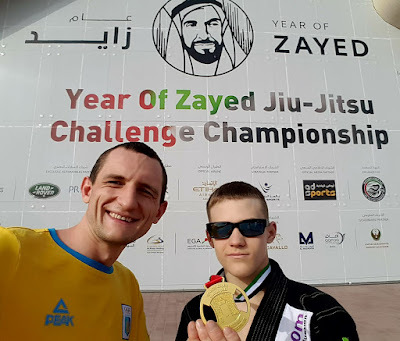 Ukrainian fighter from the SC “Borets” / ZR Team successfully competed at the “Year of Zaed Jiu-Jitsu Challenge Championship” that took place in the Abu Dhabi last weekend. In total 2 856 participants from 7 to 18 years old took part in this great sport event. 28 young athletes from all over the world were also in the category of Ukrainian fighter Serhii Krasovskyi. According to the results of the matches Serhii Krasovskyi took gold and became a winner of the “Year of Zaed Jiu-Jitsu Challenge Championship”! In general, sportsman held 4 successful fights: three of them were finished prematurely and in the last one he received confident victory by points. Besides of his well-deserved gold medal Serhii Krasovskyi also got a $500 prize for the first place! The head coach of the SC “Borets” / ZR Team Ievgen Skyrda noted that Serhii’s category was full of worthy competitors that helped Serhii to achieve another unique sports experience. It must be noted that Serhii Krasovskyi also was going to the “South America Continental Pro” championship. Unfortunately, there weren’t enough competitors in his category. Nevertheless, Serhii did not waste his time and competed in the “Year of Zaed Jiu-Jitsu Challenge Championship”.